We’re proud to announce the winner of The Andrew Flusche Scholarship for the spring of 2018: Sidney Brown. Sidney is from Wiggins, Mississippi. 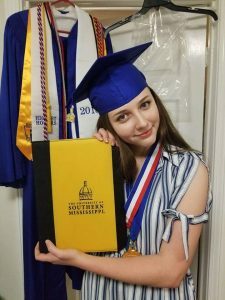 She is attending University of Southern Mississippi to Major in Microbiology and Minor in Chemistry and Spanish. After graduation, she plans to attend medical school and specialize in forensic or clinical pathology.